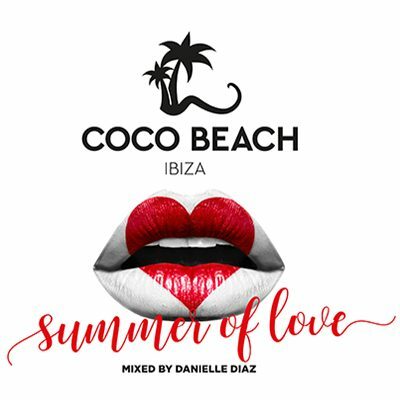 The seventh edition of the Coco Beach Ibiza compilation series provides the perfect musical soundtrack for a “Summer Of Love” with laid-back days and balmy summer nights of Ibiza. The Volume 7 was again created in cooperation with DJ Danielle Diaz & Kontor Records and comes as a 3 CD set in their noble digipack: CD1 – Good Morning Ibiza, CD2 – Life Is Better At The Beach, CD3 – Ibiza Night. All of them framed in a must-have luxurious package, surprising and attractive hiding a little booklet of photos inside reflecting the best tendencies of COCO BEACH Ibiza, located on one of the most beautiful beaches in Playa d’en Bossa. Danielle starts with a classic house “Freefall” by RCHL who opens the door to Kygo featuring Jason Walker’s “Sunrise”, a catchy disco track that everyone likes to step in. She successfully adds to her recipe some other sentimental and happy songs like “The Color Of Love (Lello Russo Remix) by Lino Di Meglio or Sebastien Extended Remix “Missing” by Mark Sixma & Emma Hewitt, many house and downtempo, disco as you like it with Claptone Remix “The First Time Free” by Ultra Nate vs Roland Clark and Jonas Blue Remix “Old Friends”, many dance tracks as “Don’t Lie (Satin Jackets Remix) by Loui & Scibi, “Coming Up” by Tungevaag & Raaban featuring Victor Cronet, “Little Hollywood” by Alle Farben & Janieck and “I Thought I Heard You Screaming” by Lexer. This wide selection of a rich variety is well-established now as Danielle Diaz’s mark and will give her fans all that they need for a successful summer of love at Coco Beach Ibiza that belongs to the absolute hot spots of the popular Balearic Island, with its successful blend, exquisite restaurant and exclusive beach club. Even in its 14th season, fantastic food, cool drinks, great events and relaxed music invite you to linger by the sea.